In the 20th century humanity consumed products faster than ever, but this way of living is no longer sustainable. This new and important book shows how technological advances are driving forms of `collaborative consumption' which will change forever the ways in which we interact both with businesses and with each other. The average lawn mower is used for four hours a year. The average power drill is used for only twenty minutes in its entire lifespan. The average car is unused for 22 hours a day, and even when it is being used there are normally three empty seats. Surely there must be a way to get the benefit out of things like mowers, drills and even cars, without having to carry the huge up-front costs of ownership? There is indeed. Collaborative consumption is not just a buzzword, it is a new win-win way of life. This insightful and thought-provoking new book by Rachel Botsman and Roo Rogers is an important and fast-moving survey of the dramatic changes we are seeing in the way we consume products. Many of us are familiar with freecycle, eBay, couchsurfing and Zipcar. But these are just the beginning of a new phenomenon. Rachel Botsman and Roo Rogers have interviewed business leaders and opinion formers around the world to draw together the many strands of Collaborative Consumption into a coherent and challenging argument to show that the way we did business and consumerism in the 20th century is not the way we will do it in the 21st century. "People are normally trustworthy and generous, and the Internet brings the good out far more than the bad. That's the big observation from my day job, customer service, for fifteen years. We're seeing an explosion of modest businesses where people help each other out via the Net, and What's Mine is Yours tells you what's going on, and inspires more of the same." "What can the next wave of collaborative marketplaces look like? Botsman and Rogers answer this question in a highly readable and persuasive way. Anyone interested in the business opportunities and social power of collaboration should consider reading this book." - Tony Hsieh, author of Delivering Happiness and CEO of Zappos.com, Inc.
"After listening to a thousand tirades against the excesses and waste of consumer society, What's Mine Is Yours offers us something genuinely new and invigorating: a way out. Anyone interested in the emerging economics of collaboration will want to read this profoundly hopeful book." - Steven Johnson, author of The Invention of Air and The Ghost Map. "At a moment of general gloom, Rachel Botsman and Roo Rogers have offered a convincing, charming and in every sense collaborative account of how the new networks that have disrupted our lives are also likely to alter them, and entirely for our good. They offer not just a prescription for parts of our ailing economy, but a new vision of what `consumerism' can be: not just a form of slavery to objects, but a thing in itself positive, progressive and pleasure-giving." "Much of what we most value is created with other people, through relationships. Friendship, care, love, recognition are not delivered to us in a package. 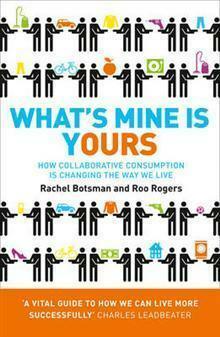 That's why What's Mine Is Yours charting Collaborative Consumption is such a vital guide to how we can live more successfully. " Rachel writes, consults, and speaks on the power of collaboration and sharing, and on how it can transform the way we live. She received her BFA (Honors) from the University of Oxford, and undertook her postgraduate studies at Harvard University. She has consulted to businesses around the world on brand and innovation strategy and is a former director at the William J. Clinton Foundation. Roo is a serial entrepreneur with five successful startups currently in the marketplace. He is currently the director of Redscout Ventures. Roo has a BA from Columbia College and a Masters in Economics from University College London. Roo sits on the board of two nonprofits: Medecins du Monde UK and The Bronx Community Charter School.